What are shadow people? This question has been asked time and time again by people that have experienced them and those that research them. Some researchers believe that they are extraterrestrials or beings from other dimensions as well as ghost or disincarnate spirits. Stories and experiences in regards to shadow people have been around for years. Those who experience them describe them as "Watchers" that seem to observe the person while he or she is in bed. They are also described as very tall beings usually six-and-a-half feet tall sometimes wearing a hat, coat or nothing at all. One person I have talked to about their experience calls him "The Hat Man". 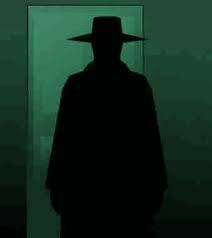 The Hat Man is the most common shadow person reportedly witnessed by numerous people during the night. Who or what is The Hat Man? Maybe we will never know. That is why there is still ongoing research into this phenomenon. Two people who have shared their experiences with me say that they have had encounters with the hat man since they were small children and still continue to see him. Another person I spoke with has only had an encounter once as a child and once as an adult. 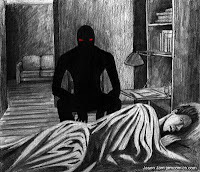 One case I worked on here recently, reported they had only experienced the shadow man while living in the home. One question I have, is why do certain people encounter him more often when some do not? Are the ones who experience him more often more sensitive perhaps to this phenomenon? 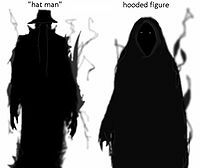 Another commonly reported shadow sighting is the hooded shadow, which has the same watching characteristics as the Hat Man, only wearing a hood. Shadow people fall into different categories. RoseMary Ellen Guiley has classified the different categories in her Encyclopedia of Ghost and Spirits. Pages 444-445 See below. Bedroom Watchers: These figures are discovered standing by a bedside or in a corner of the room when a person awakens in the night. They seem to stare at people in bed, even though they have no visible eyes or facial features. Most do not behave in a threatening manner, though their presence is often terrifying. They can remain for long periods of time and when observed, disappear suddenly or melt through walls and ceilings. Some act aggressively toward people, causing choking sensations similar to the "old hag". Shadows on walls: These figures appear suddenly as dark human outlines on walls, which detach from walls and move about rooms. Moving Shadows: These figures appear abruptly and move quickly through a room, as thought on a mission. They come through walls and melt into walls. They may seem to pay no attention to people present or else watch them intensely. They may be seen out of the corners of the eyes or in full view. 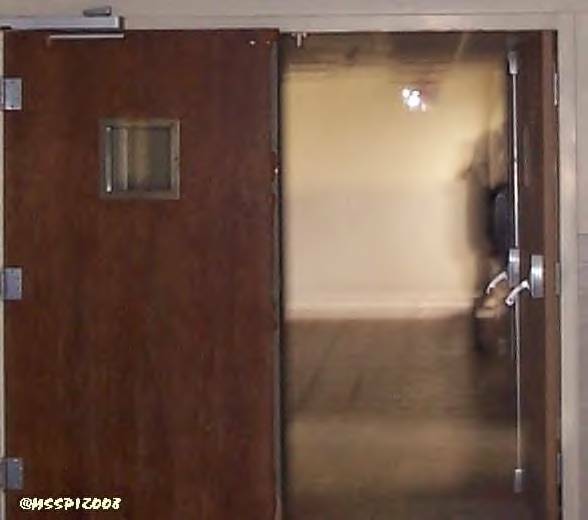 Background Visitors: These figures usually are not seen, but are captured in photographs. They appear in backgrounds, their forms noticeable on walls, doors, and so forth. Haunting presences: These figures appear in places known or thought to be haunted. They move about, act with intelligence, and appear and disappear suddenly They may follow people. In some cases, shadow people are associated with bad luck. Some expierencers that I have interviewed, feel very uneasy when they encounter them, Though they have never been harmed by them they often feel like they are malevolent or negative. Some people even feel as if they are demonic in nature. 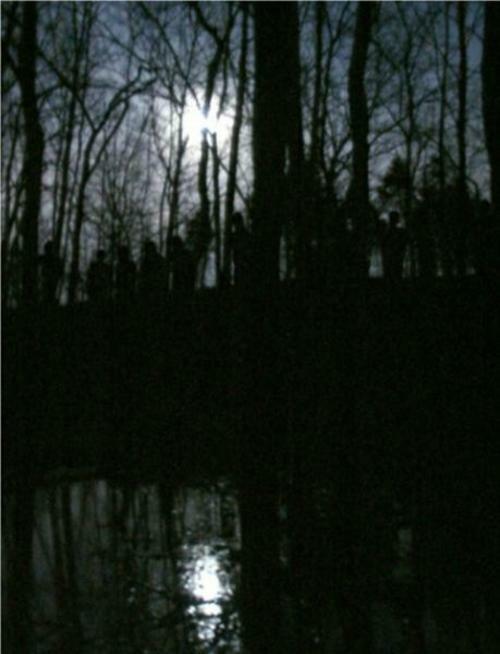 However, shadow people rarely interact with the eyewitness and claims of harm or injury from them appear to be rare. Another theory suggests that shadow people are time travelers or visitors from another world/universe. Do they come here to check on us for some reason? Are they simply curious about us? They apparently do spend a lot of time here. Why? Maybe they’re not even here at all. Is it possible that they’re simply “people” that live on another plane of existence? Could we be getting a glimpse into that parallel dimension? Perhaps we also appear as shadow people to them. As to whether they are interdiminsional beings or ghost I can not say, since I am still collecting stories on them, but if they are ghost I believe the reason they show themselves as shadows is maybe that is the only way they can manifest themselves, like that is all the energy they can collect at that time and show themselves in that form. The reason I say this, is on one occasion my team and I were doing a preliminary of an old abandoned hospital. I was taking random pictures and upon review of my pictures I had photographed a shadow person that looked like a nurse, I did not see this shadow person she only showed up in my picture. Was it a former nurse who could only manifest as a shadow? In my personal opinion I would say yes, I believe that was all the energy she could gather at that time and that is how she appeared in my picture. 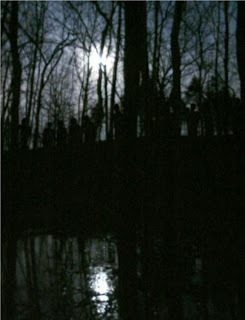 Other articles I have read mention seeing shadow people in the woods. One such place is Zombie Road (pictured right )where numerous shadow people or kids have been photographed. You can view this strange incident in the Children of The Grave Documentary. Also shadow people figures have been seen at various alleged haunted locations such as Waverly Hills and Ohio State Reformatory. So the research into what shadow people are continue to this day and I encourage all researchers to share their theories, findings, and resources about these beings so that we may all have a better understanding as to what they are and what the phenomenon is. 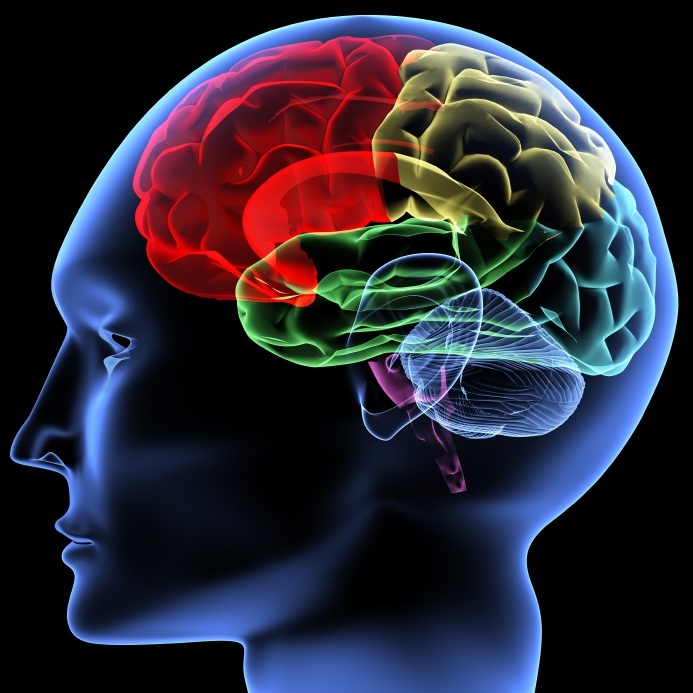 Schizophrenia and Mental Disorders- What you should know. In the study of the paranormal, one common explaination for ghost sightings and paranormal experiences, that I have heard frequently suggested, is that maybe the person has schizophrenia or some other mental form of delusional disorder. Because this has been a common and frequently misunderstood assumption for those who have never had a paranormal or suggested haunting experience, many people have kept their experiences a secret, out of the fear of being labeled as psychotic, crazy or schizophrenic. I think that those who are going to research claims of hauntings and paranormal experiences need to at least have a basic knowledge of what those type diseases are and their symptoms. I think that the majority of people that paranormal researchers interview, are not suffering from mental disorders or schizophrenia. However, the possibility that you could encounter someone with these type claims who does suffer from a mental disorder, is always a possibility. Especially, now that television has saturated the airways with TV shows related to everything from sea monsters, to aliens, to ghost stories and demon possessions. So it is possible that you could encounter someone who truely suffers from these disorders, and may have these fears intertwined within their behaviors. Remember that when you research the paranormal, there are many aspects that have to be considered and understood in order to rule them out. If you are not aware of the true symptoms and behaviors of persons with these disorders, how can you properly evaluate claims of paranormal experiences? This is a brief overview of common mental diseases and disorders that have been suggested as possible causes, related to paranormal experiences. This should be something that paranormal researchers make themselves familiar with. Having been in the nursing field for twenty years, I have cared for many patients with mental and schizophrenic type disorders and diagnosis. I have seen many bizzare behaviors and heard many claims of hearing voices or having visual hallucinations, however, not one of them ever claimed to see ghosts or told tales of being haunted. In fact, most of their claims were way more bizarre than that. The most common symptom I have encountered, has been of a more paranoid nature. One particular example would be a patient that I cared for who was convinced that there was a government conspiracy against him and that he could hear coded messages about terroist acts thru his am radio. He also believed that he had a million dollars in the local bank and that all the nurses were trying to poison him. He frequently would sneak into the nurses station and telephone the bank, demanding his money be brought to him by armed guards. On one occasion, he even called the local police to report a hostage crisis at the nursing facility, which resulted in the SWAT team being deployed and the facility being put on lock down for several hours. He had extreme mood swings, poor personal hygiene. He had difficulty with trusting anyone and had very poor socializing skills. His behaviors were often times erradic, explosive and full of anxiety. Other times, he could be seen in a sureal mood, mumbling or talking to himself, or sitting quietly in almost a trance like state. This type behavior , to me, in my own experience, has been the type behavior and symptoms I have seen the most, with people diagnosed as Schizophrenic. Another example was a woman who had bizarre hallucinations. On one occasion while having a rather normal conversation with me about her lunch menu, she began to scream histerically because she was convinced that I my back was crawling with black spiders. This same lady also tore her room apart because she claimed that her TV set was sending radiation waves into her brain with subliminal messages in order to control her mind. These behaviors could occur anywhere from a few days or a few moments of each other. These behaviors could occur anywhere at anytime. Unlike typical claims of paranormal experiences which might only occur once in a persons otherwise normal lifetime. Just because a person has an experience or even several unexplained experiences, that they cannot explain, does not make them crazy. To label someone as such without trying to understanding their experience, is shameful in my opinion. Schizophrenia is a serious brain disorder that distorts the way a person thinks, acts, expresses emotions, perceives reality, and relates to others. People with schizophrenia -- the most chronic and disabling of the major mental illnesses -- often have problems functioning in society, at work, at school, and in relationships. Schizophrenia can leave its sufferer frightened and withdrawn. It is a life-long disease that cannot be cured, but usually can be controlled with proper treatment. 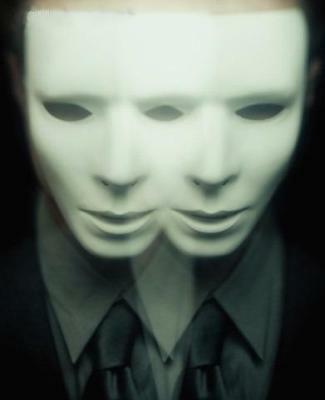 Contrary to popular belief, schizophrenia is not a split personality. Schizophrenia is a psychosis, a type of mental illness in which a person cannot tell what is real from what is imagined. At times, people with psychotic disorders lose touch with reality. The world may seem like a jumble of confusing thoughts, images, and sounds. The behavior of people with schizophrenia may be very strange and even shocking. A sudden change in personality and behavior, which occurs when people lose touch with reality, is called a psychotic episode. Schizophrenia varies in severity from person to person. Some people have only one psychotic episode while others have many episodes during a lifetime but lead relatively normal lives between episodes. Schizophrenia symptoms seem to worsen and improve in cycles known as relapses and remissions. Schizophrenia is a brain disorder that affects some 2.2 million American adults, most often before the age of 30. It interferes with the way a person acts, thinks, and feels and frequently causes difficulty distinguishing between what is real and what is imaginary. This, in turn makes patients prone to delusional beliefs about themselves or others. Schizophrenia also affects ordered thinking, making it difficult to concentrate, maintain attention span, or develop normal motivation. It can also affect the ability to experience normal emotions in social situations, often causing a person to become unusually unresponsive or withdrawn.Often times leading to severe bouts of depression and even suicidal tendencies. Psychosis: Psychosis is defined as being out of touch with reality. During this phase, one can experience delusions or prominent hallucinations. People with psychoses are not aware that what they are experiencing or some of the things that they believe are not real. Psychosis is a prominent feature of schizophrenia but is not unique to this illness. Schizoid: This term is often used to describe a personality disorder characterized by almost complete lack of interest in social relationships and a restricted range of expression of emotions in interpersonal settings, making a person with this disorder appear cold and aloof. Schizotypal: This term defines a more severe personality disorder characterized by acute discomfort with close relationships as well as disturbances of perception and bizarre behaviors, making people with schizophrenia seem odd and eccentric because of unusual mannerisms. Hallucinations: A person with schizophrenia may have strong sensations of objects or events that are real only to him or her. These may be in the form of things that they believe strongly that they see, hear, smell, taste, or touch. Hallucinations have no outside source, and are sometimes described as "the person's mind playing tricks" on him or her. Illusion: An illusion is a mistaken perception for which there is an actual external stimulus. For example, a visual illusion might be seeing a shadow and misinterpreting it as a person. The words "illusion" and "hallucination" are sometimes confused with each other. Delusion: A person with a delusion has a strong belief about something despite evidence that the belief is false. For instance, a person may listen to a radio and believe the radio is giving a coded message about an impending alien invasion. All of the other people who listen to the same radio program would hear, for example, a feature story about road repair work taking place in the area. People with schizophrenia vary widely in their behavior as they struggle with an illness beyond their control. In active stages, those affected may ramble in illogical sentences or react with uncontrolled anger or violence to a perceived threat. People with schizophrenia may also experience relatively passive phases of the illness in which they seem to lack personality, movement, and emotion (also called a flat affect). People with schizophrenia may alternate in these extremes. Their behavior may or may not be predictable. Positive symptoms -- Hearing voices, suspiciousness, feeling under constant surveillance, delusions, or making up words without a meaning (neologisms). Paranoid-type schizophrenia is characterized by delusions and auditory hallucinations but relatively normal intellectual functioning and expression of affect. The delusions can often be about being persecuted unfairly or being some other person who is famous. People with paranoid-type schizophrenia can exhibit anger, aloofness, anxiety, and argumentativeness. Disorganized-type schizophrenia is characterized by speech and behavior that are disorganized or difficult to understand, and flattening or inappropriate emotions. People with disorganized-type schizophrenia may laugh at the changing color of a traffic light or at something not closely related to what they are saying or doing. Their disorganized behavior may disrupt normal activities, such as showering, dressing, and preparing meals. I found this video to be a very good example of a disorganized type schizophrenia. Catatonic-type schizophrenia is characterized by disturbances of movement. People with catatonic-type schizophrenia may keep themselves completely immobile or move all over the place. They may not say anything for hours, or they may repeat anything you say or do senselessly. Either way, the behavior is putting these people at high risk because it impairs their ability to take care of themselves. Undifferentiated-type schizophrenia is characterized by some symptoms seen in all of the above types but not enough of any one of them to define it as another particular type of schizophrenia. Residual-type schizophrenia is characterized by a past history of at least one episode of schizophrenia, but the person currently has no positive symptoms (delusions, hallucinations, disorganized speech or behavior). It may represent a transition between a full-blown episode and complete remission, or it may continue for years without any further psychotic episodes. Delusional disorder, previously called paranoid disorder, is a type of serious mental illness called a "psychosis" in which a person cannot tell what is real from what is imagined. The main feature of this disorder is the presence of delusions, which are unshakable beliefs in something untrue. People with delusional disorder experience non-bizarre delusions, which involve situations that could occur in real life, such as being followed, poisoned, deceived, conspired against, or loved from a distance. These delusions usually involve the misinterpretation of perceptions or experiences. In reality, however, the situations are either not true at all or highly exaggerated. People with delusional disorder often can continue to socialize and function normally, apart from the subject of their delusion, and generally do not behave in an obviously odd or bizarre manner. This is unlike people with other psychotic disorders, who also might have delusions as a symptom of their disorder. In some cases, however, people with delusional disorder might become so preoccupied with their delusions that their lives are disrupted. Some studies have indicated that delusions may be generated by abnormalities in the limbic system, the portion of the brain on the inner edge of the cerebral cortex that is believed to regulate emotions. The exact source of delusions has not been conclusively found, but potential causes include genetics, neurological abnormalities, and changes in brain chemistry. Delusions are also a known possible side effect of drug use and abuse. As well as alcohol abuse. Erotomanic: Someone with this type of delusional disorder believes that another person, often someone important or famous, is in love with him or her. The person might attempt to contact the object of the delusion, and stalking behavior is not uncommon. Grandiose: A person with this type of delusional disorder has an over-inflated sense of worth, power, knowledge, or identity. The person might believe he or she has a great talent or has made an important discovery that either has or has not been properly recognized Or they may believe that they have some sort of social status or are someone famous or of high religious or governmental status . Jealous: A person with this type of delusional disorder believes that his or her spouse or sexual partner is unfaithful. Persecutory or Paranoid: People with this type of delusional disorder believe that they (or someone close to them) are being mistreated, or that someone is spying on them or planning to harm them or is out to get them. They frequently believe that they are being cheated, stolen from, stalked and or harrassed. It is not uncommon for people with this type of delusional disorder to make repeated complaints to legal authorities and make numerous court appeals in civil suits. Somatic: A person with this type of delusional disorder believes that he or she has a physical defect or medical problem. Referencial: The belief that everyday things in the normal environment, such as advertisements, newscasts, song lyrics, book passages and trade signs are directly addressed to him or have some secret coded meaning. Mixed: People with this type of delusional disorder have two or more of the types of delusions listed above. What Are the Symptoms of Delusional Disorder? Want to dig deeper? Below is an interesting website I stumbled upon which list 176 different diseases and possible causes of delusions. Patients may experience an extremely broad array of other symptoms that may appear to resemble epilepsy, schizophrenia, anxiety disorders, mood disorders, post traumatic stress disorder, personality disorders, and eating disorders. It has been theorized that severe sexual, physical, or psychological trauma in childhood predisposes an individual to the development of DID. Most of us have experienced mild dissociation, which is like daydreaming or getting lost in the moment while working on a project. However, dissociative identity disorder is a severe form of dissociation, a mental process, which produces a lack of connection in a person's thoughts, memories, feelings, actions, or sense of identity. Dissociative identity disorder is thought to stem from trauma experienced by the person with the disorder. The dissociative aspect is thought to be a coping mechanism -- the person literally dissociates himself from a situation or experience that's too violent, traumatic, or painful to assimilate with his conscious self. Other symptoms of dissociative identity disorder may include headache, amnesia, time loss, trances, and "out of body experiences." Some people with dissociative disorders have a tendency toward self-persecution, self-sabotage, and even violence (both self-inflicted and outwardly directed). As an example, someone with dissociative identity disorder may find themselves doing things they wouldn't normally do such as speeding, reckless driving, or stealing money from their employer or friend, yet they feel they are being compelled to do it. Some describe this feeling as being a passenger in their body rather than the driver. In other words, they truly believe they have no choice. People with bipolar disorder experience unusually intense emotional states that occur in distinct periods called "mood episodes." An overly joyful or overexcited state is called a manic episode, and an extremely sad or hopeless state is called a depressive episode. Sometimes, a mood episode includes symptoms of both mania and depression. This is called a mixed state. People with bipolar disorder also may be explosive and irritable during a mood episode. Sometimes, a person with severe episodes of mania or depression has psychotic symptoms too, such as hallucinations or delusions. The psychotic symptoms tend to reflect the person's extreme mood. For example, psychotic symptoms for a person having a manic episode may include believing he or she is famous, has a lot of money, or has special powers. In the same way, a person having a depressive episode may believe he or she is ruined and penniless, or has committed a crime. As a result, people with bipolar disorder who have psychotic symptoms are sometimes wrongly diagnosed as having schizophrenia. Bipolar disorder tends to run in families, so researchers are looking for genes that may increase a person's chance of developing the illness. Anxiety disorders are mental disorders characterized by extreme, unpleasant, and unwanted feelings of apprehension or fear, sometimes accompanied by physical symptoms. Delirium is a mental state in which a person suddenly becomes confused and disoriented, perhaps not knowing what day it is or not recognizing a friend. It often accompanies a physical illness and usually goes away when the illness gets better. Dementia is a gradually worsening loss of mental abilities, including memory, judgment, and abstract thinking. It is more common in older people. Depressive disorders are mental disorders associated with feelings of sadness, hopelessness, and loss of self-esteem and enjoyment. Significant levels of depression impair a person's feelings, thoughts, and behaviors. Eating disorders are mental disorders that lead people to starve themselves or to eat huge amounts of food. Mental retardation is a condition present since childhood in which the person has significantly below-average intelligence. These individuals may be limited in their ability to learn, work, communicate with others, care for themselves, and live independently. Neurosis (noo-RO-sis) is a broad term covering many mental disorders that are long-lasting or recurring. People who have a neurosis remain in touch with reality, unlike those who have a psychosis. But the anxiety, depression, and distress common to neurosis can interfere with the quality of life. Obsessive-compulsive disorderis a mental disorder that causes people to feel trapped by distressing or senseless thoughts and to feel as if they have to repeat actions. Phobias are mental disorders that lead to a lasting, intense, irrational fear of a particular object, activity, or situation. Post-traumatic stress disorder is a mental disorder that interferes with everyday living and occurs in people who survive a life-threatening event, such as school violence, car accidents, natural disasters (earthquakes, hurricanes, floods), or military combat. Separation anxiety is a mental disorder in which children worry excessively about leaving their homes, parents, or caregivers. Sleep disorders are long-lasting disturbances of sleep. Some sleep disorders have mainly psychological causes, while others have mainly physical causes. * psychotherapy is treatment for a mental disorder that usually involves talking with a trained therapist to undercover the roots of a person's behavior or to learn new ways of thinking or behaving. I hope that this post will help clear up any misconceptions you may have had about mental disorders and schizophrenia. I believe that it is imperative that people understand the truth of what these disorders are and how those who are afflicted with them, behave. Below you will find a list of resources that you can refer to if you have any questions related to mental health issues or should you encounter or know someone that you believe might benefit from the information. There are also many interesting case files and examples of persons with these disorders that you can search on YouTube. I found several related to DID to be most interesting. U.S. National Institute of Mental Health, 6001 Executive Boulevard, Room 8184, MSC 9663, Bethesda, MD 20892-9663. NIMH is the government institute that oversees research on mental disorders and provides information for professionals and the public. American Psychological Asssociation, 750 First Street NE, Washington, DC 20002-4242. The American Psychological Association publishes books, brochures, and fact sheets about mental health, mental disorders, and psychotherapy. It provides referrals to local psychologists, and its website includes a KidsPsych feature. American Psychiatric Association, 1400 K Street NW, Washington, DC 20005. The American Psychiatric Association publishes the Diagnostic and Statistical Manual of Mental Disorders for doctors, and the Let's Talk Facts About pamphlet series for the public. Its website also posts a Psychiatric Medications fact sheet. National Alliance for the Mentally Ill, 200 North Glebe Road, Suite 1015, Arlington, VA 22203-3754. A self-help organization for people with serious mental illness, their families, and their friends. National Mental Health Association, 1021 Prince Street, Alexandria, VA 22314-2971. A national organization that offers information to the public about various mental disorders and mental health.